A few months ago I decided that Crom Worshippers should have Amulets too (The snake worshippers have loads) so I started thinking up designs. This is the first, loosely inspired by the Crossguard on the Father's Sword. I'll be making more soon and refining my sculpting skills as I go. 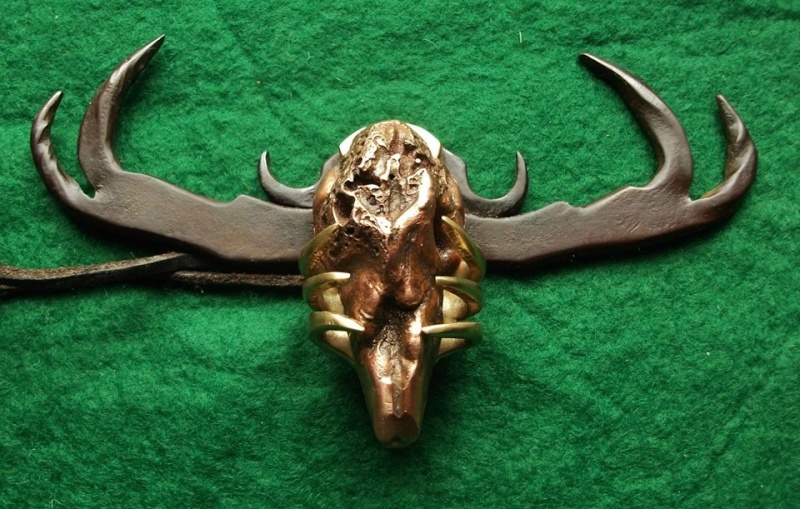 This piece is clay cast true Bronze (90% copper, 10% Tin) mounted on a hand forged steel backplate. 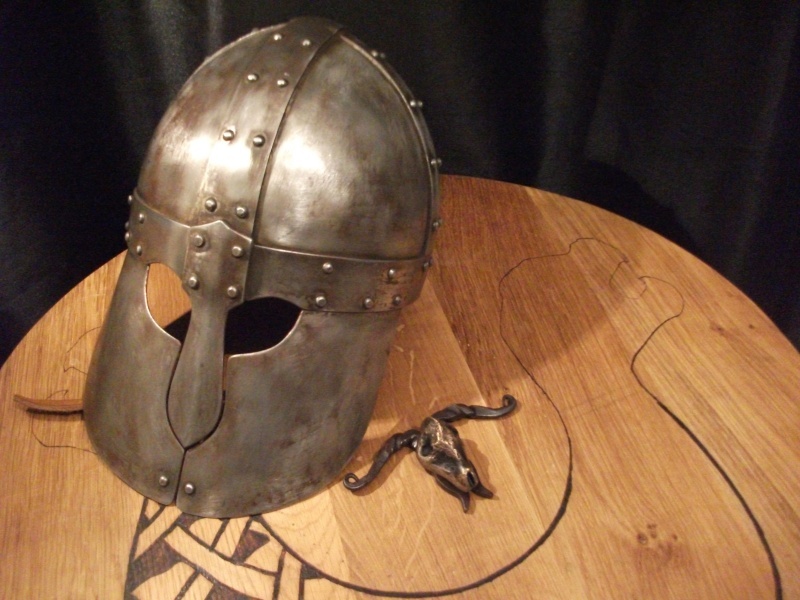 The steel has been Antique browned, it is attached by threaded brass pins in the back. Any ideas on further designs/materials/improvements are welcome! Doesn't Conan wield the "Wheel of Pain" Amulet in the movie? I think it symbolizes the essence of Crom pretty well. You must have thought of the Father's Sword while making this one. 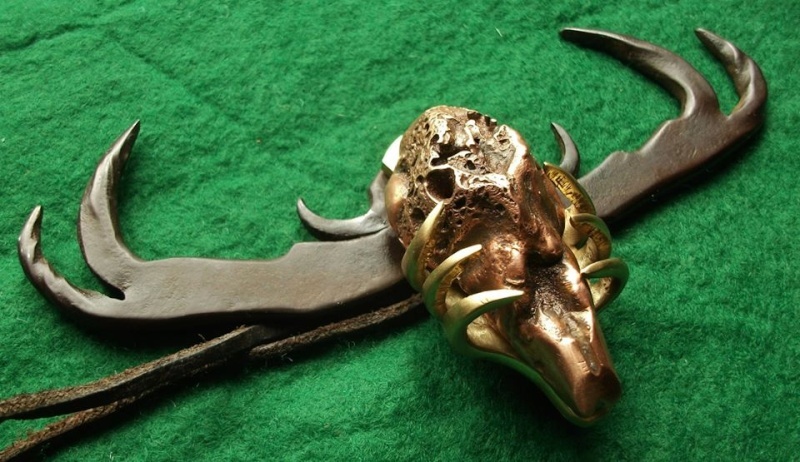 Btw I like the amulet you made out of Bone (Thors Hammer) a lot! And to me it suits more to the world of "conan" or the "hyberian" age. It is sold, unfortunately, isn't it? The wheel of pain may well be a Vanir symbol in the movie... I like to think Conan wore it to remind him he was the lone survivor. 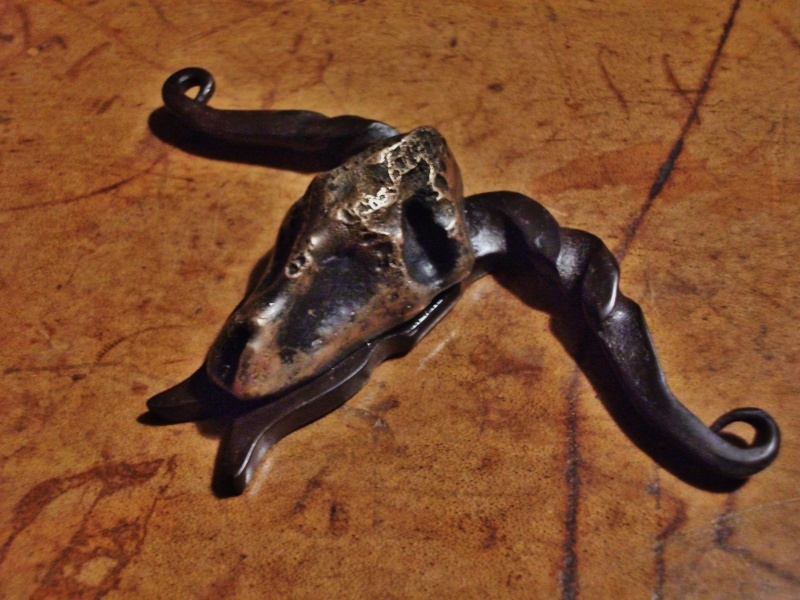 Yes it did sell, i'll make another when I find a sheep's tail bone again. Do that because I was just about to buy it when I saw it was gone I am from Germany btw and don't use paypal..
Nice work mate,very rustic which i like. For me i'd prefer to see it have more the antlers of the father's sword but as a first it's great. 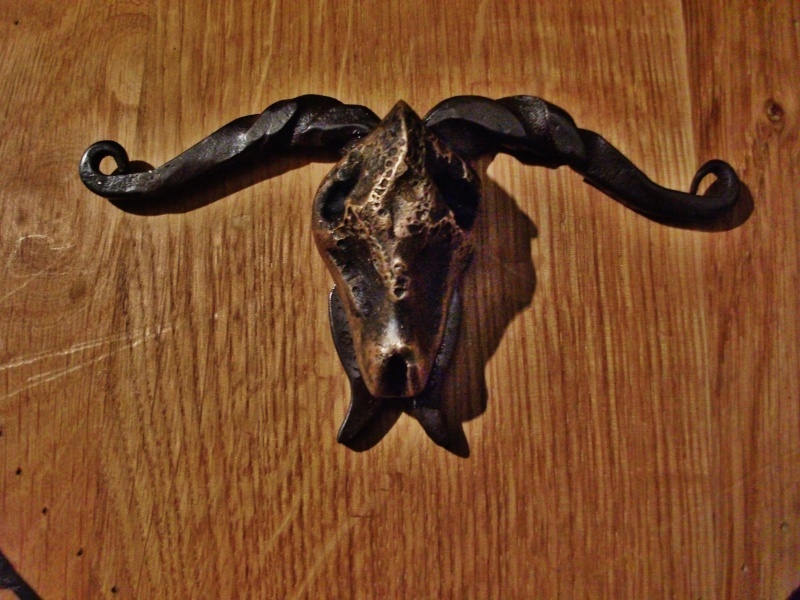 I love your forged works. 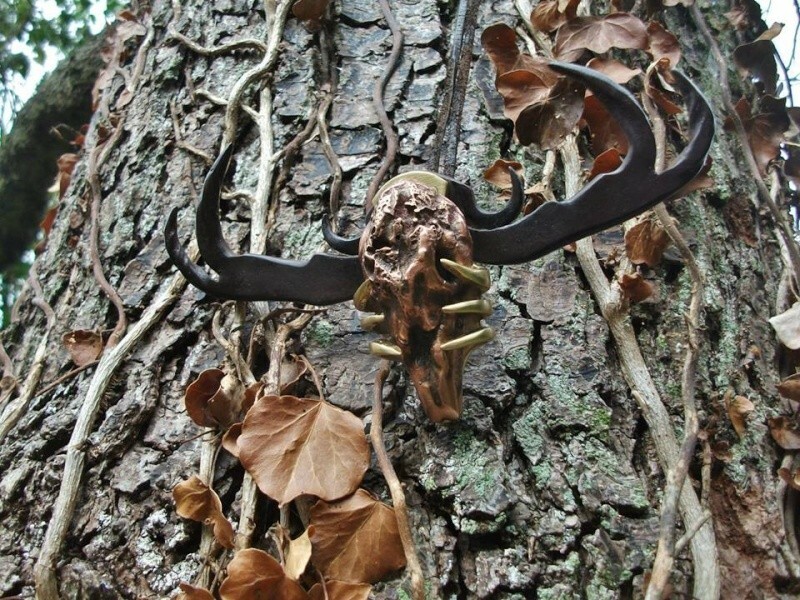 The skull is pure copper, mounted on a hand forged piece of brass, with forged steel antlers. Nice mate. I think that's pretty awesome. » Prototype Pee Wee or ???? ?